In this post I wanna talk more about the design iterations the map went through, so I’ve made the following collage to showcase just that. ( 1 ) [first paper prototype, far left] I initially designed a single platform for Death Match map, I imagined it to be on a mountain top, with the rivers in blue swirls and black squiggly line as rock walls part, all to work as separators between the pods where players spawn. The pods were 2-story and they had bridges to connected them all on the roofs. The colored dots represent health, and ammo packs and spawn points. The mountain top would have 3 levels in height difference. The pods in the lowest level of the mountain top, and the orange platform is central and on the highest level. An exposed vantage point. I pictured the aesthetics to be foggy, and nature focused. 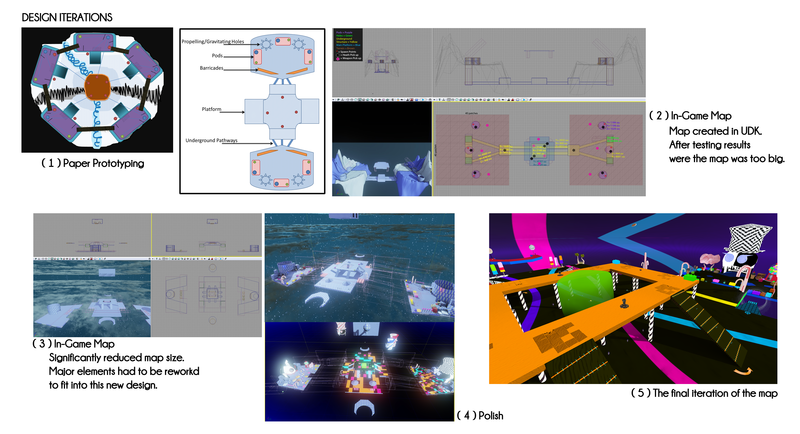 [second paper prototype, second to the left] I’ve redesigned the map to be a Team Death Match map, I thought It was more suitable for the original idea, and I also wanted to add jumps and gravity mechanics. I was messing around with the physics in UDK with my professor and we had jumps. I loved the feeling of the jumps so I integrated them in the game. Two mountain tops connected via underground tunnels. And a central exposed platform, that was placed higher than the mountain ground level. Each island has 3 pods for each team, 2 holes for jumps and gravity pull holes. Gravitating holes *I still can’t think of a better name lol, any suggestions? * to pull the players down to the underground tunnels/room. Jump holes to propel the players to the central platforms, and that was the only way to get to it. Mid-air kills were fun when testing this. For this one, I pictured it in a remote planet, deserted by some civilization, that can be seen in the underground tunnels, and the player pods are of the robotic aliens that landed on that planet. Very red/orange for the world with blue and grey for the objects. The underground tunnels were to be observatory tunnels, you can see the outside world. ( 2 ) I was happy with the paper prototype, so I built it in the game engine. After a few testing rounds, I realized I’ve built a huge map in comparison to the UDK default robots characters. ( 3 ) I’ve cut down a lot of excess fat from the map, shrunk it down. At this point, I was inspired to create a totally different world theme from the I originally planned and researched for. It started with when I dragged the underground room box up in the sky to clean up, and I tested the map for something, then I noticed the box in the sky floating, I thought Jack-in-the-Box! I can do a bizarre toys/circus/candy world, and it was like a flood gate opened with ideas. I was pretty excited to create such a world. So I did my research, created the 3D models of the world in Maya. ( 4 ) The awesome process of polishing started, notice the fine lines of pink, those are the physics areas. I experimented with so many textures, for some objects I had a clear idea of what I wanted but for the ground texture, that was tricky. At some point, the game was radioactive, everything was glowing and dizzying lol. I wanted the players to feel slightly disoriented so I integrated optical illusions in the textures and had them move every so slightly. And in the Jack-in-the-Box, the creep factor were the clowns. I used some of these, I wish I know who took them so I can credit them properly. Kudos to whoever did, and to the models. Along with the images, I added sounds the portrays, whisper-y voices and shouts. ( 5 ) Final iteration of the map. I toned down the radioactive-ness by reducing the glow in the world. And ta-da! That’s it. Download the game here. And for instructions on who to play it on UDK player follow the instructions at the end of this post.